Ruhollah Moosavi Khomeini was the Iranian religious and revolutionary leader. He received a religious title of Ayatollah (a high-ranking title given to the experts in Islamic studies) in the 1950s. 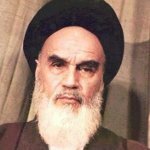 Khomeini led the clerical strike, that forced the government of Iran to abandon the draft law on regional and local communities in 1962. In 1963 he persuaded to decree a boycott of the White Revolution, a six-point program of reform, announced by the Shah. Khomeini continued the struggle against Shah's regime, that's why he was repeatedly arrested. He was forced to exile in 1964, but even this didn't stop his revolutionary struggle. Khomeini returned to Iran on January 31, 1979 after the Shah and his family had fled the country. A referendum on creation of the Islamic Republic of Iran was held on May 31 of the same year. The majority supported the referendum and Khomeini became the first Supreme Leader of Iran.